Tracy needs to know the cheapest place to buy balloons and a birthday cake for 20. Any ideas? Kroger sells helium ballons for $1. Otherwise, you can hang regular balloons down from light fixtures and tie them bunched on the mailbox. Has anyone done the math on portable helium tanks? I dealt with the balloons problem by not having balloons (well, not much - when my daughter wanted a "balloon theme" it was hard to get around them). Instead, I made several sets of fabric streamers, one in primary colors and one in lighter colors, to decorate our mailbox, front porch and dining room (where we typically have cake for celebrations). They're long strips, maybe two and a half feet, and I used pinking sheers all around with a simple straight stitch to reinforce the edges. Then each strip - five or six for each bundle - is gathered at the top in a ring. Because of the nature of the "themes" my kids like, the color groupings seem to work well. I don't know the cost of this off-hand but I didn't buy anything just to make them, it was all scraps and such. I've used each set several times now and only one item from the primary set (the one that goes on the mailbox) is getting so ratty looking that I'll look to replace it when I have enough scraps to do another. Another thing I've been looking to do is replace party streamers with bunting or by making a bunch of fabric "yo-yos" and stitching them together in a long chain. It's on my long-term "to do" list. We tie three non-helium balloons to the corner of each dining-room chair. It's festive and looks abundant and costs pennies per birthday. I also bought a Happy Birthday paper banner with streamers for $2.49 at Target and have used it for 5 birthday's so far. It's caused really funny reactions like a birtday note from the milkman and the mail carrier. Great bang for the buck. You may actually have trouble getting a hold of a tank. Helium prices have gone up due to a shortage and some party stores no longer rent tanks to their customers. Costco has the best prices on large birthday sheet cakes as I remember at least in my east coast area. My only experience with portable helium tanks was when I moved into my current home and the previous owners left 2 empty tanks in the basement. It was very difficult to find a place to accept those for disposal. We used to live near a family-owned grocery store who would inflate balloons for 10-cents each if you bought the balloons there. For less than $2, we could get a pack of 12 regular balloons (not mylar) and have them inflated. It would be worth it to make a few phone calls to off-chain stores for comparison. At our recent ballerina party, I hung vertical streamers with (fishing line with hearts and silk flowers) and when I ran out of time for hanging balloons (after having decided against buying helium this time), I blew up a two bag of balloons, one pink and one lavender, and just scattered them across the floor. It was a big balloon effect for only $2. We bought a helium tank years ago and we've used it a lot. It really is the way to go if you're into balloons! I tie balloon bunches to the dining room light fixture for each birthday...it's become our "thing". I haven't done the math on the helium tanks as I just can't stand to think of them all laying in the landfills after they've been used up. I like the other gals idea to tie small balloon bunches to the backs of the chairs...very festive! I sent an email out to a mom's group I belong to and asked who had the cake pans in shapes I could borrow. I've used other peoples pans and then cupcakes for extras. I used boxed cake mixes and icing bought with coupons/sales. My in-laws think it's horrible that the kids cakes are homemade, but it was tradition at our house. I would just blow up balloons. The kids' Daddy traditionally takes the birthday child to the Dollar Store for one helium balloon. I guess the question could have been about an adult party though. Balloons are pretty inexpensive so you should be able to have an abundance without too much cost. As for cake, I would do cupcakes. 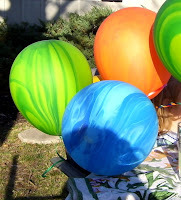 They are very "in" right now and you could maybe do different colored balloons in icing on a plain white icing base. You wouldn't have to be too artistic to draw balloons! If this is a kid's party, you could use plain white lunch bags to hold the party favors and draw balloons on it, punch holds in the folded over top and tie a balloon to end for the favor. Having the favors set out on a table makes a great decoration. My husband (the frugal one) insists the tanks are cheaper. I probably ruin it though by insisting on certain colors of balloons to match my theme, rather than the multi-color pack his tank comes with. He just can't win with me. Our Wal-Mart fills customer's own balloons with helium, free. Worth asking at yours! I love baloons at parties so stock up at Target when they do all those 75% clearances. Just this summer purchased many 'wedding' baloons in pearlized ivory and pink. They will be beautiful for birthdays, new baby, much more than weddings. Okay, Wal-Mart is the cheapest place to have a cake made for a birthday party. You can order it the day before or a couple of days before. I am getting ready to take a cake decorating class from Wilton's Cakes at Hobby Lobby (you can find 1/2 off coupons in the Sunday papers) for about $15 (withthe 1/2 off coupon of course). My goal is to take all the classes they offer and to start decorating my own cakes, with 3 kids and 1 on the way I'll come out ahead! Wal-Mart also does ballons but I have not priced them. I just found out when I saw a lady walking through the store with a bunch and she said she had purchased them here. Now as for the price on the Hellium tanks...I price them about 3 years ago so I do not recall the exact price though it was round $20 at Wal-Mart. The issue I had with it was that it was not refillable. Once you use it its done and as I recall you could only fill 20 or so ballons. I know I calculated the price of hellium tank, ballons & streamers vs what I'd pay to have it done and it was more to do it myself. I hope that helps! Yes, our WM does them for free too, if you buy the balloons there. I would add that driving home from Wal-Mart with all the filled balloons is a challenge, to say the least. The clerk DID corral the baloons into a dry-cleaning type bag, then weighted it, which helped. Prepare ahead with enough car space! Laying a light blanket over the baloon cluster behind the driver's seat keeps them safely below sightline of your rearview mirror.